From Corey Rosenbloom: So far in 2017 we’ve seen relentless selling pressure in the Energy Select Sector SPDR ETF (NYSE:XLE). This logic also applies to ETFs and broader markets as well. 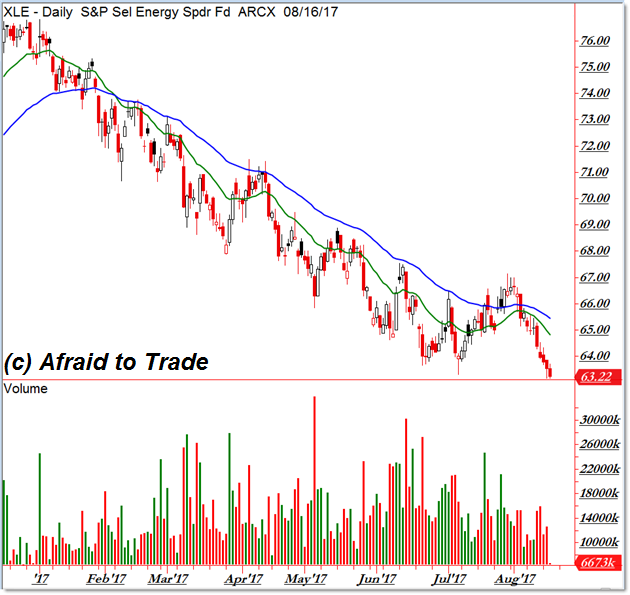 The Energy sector is the latest victim of “weak stocks get weaker” as price broke to a new swing low this morning in an ongoing daily downtrend. Also, when looking to trade a bullish swing trade in a stock scan, take a moment to check the sector trend to increase your chances of a successful outcome. Given two stocks – one in Energy and the other in an uptrending sector like Technology (XLK) – choose the one with the stronger (more bullish) sector trend. While it’s not always as clear as this, take advantage of the times it is. Unless you’re a bear — and making a lot of money here — stay out of the Energy sector until/unless we get a reversal. The SPDR Energy Select Sector Fund (NYSE:XLE) was unchanged in premarket trading Thursday. Year-to-date, XLE has declined -15.41%, versus a 11.49% rise in the benchmark S&P 500 index during the same period. XLE currently has an ETF Daily News SMART Grade of C (Neutral), and is ranked #15 of 37 ETFs in the Energy Equities ETFs category.